NetEnt casino sites have a video slot that proves it’s possible to use retro slot machine principles and still be innovative. In the Dazzle Me slot, players will find that there is much more than meets the eye. A bright colour scheme serves to highlight the dazzling gems and retro symbols appearing in the slot. At first, players will be surprised to see that there are different numbers of rows across the five reels. For instance, reels one and two have three rows, reels three and four have four rows, and the fifth and final reel has five rows. The innovative design in Dazzle Me provides a fresh way to play, with 76 fixed paylines included for players to try and win from. Ultimately, players can win up to 152,000 coins on Dazzle Me. The best of the symbols would have to be five 7s and the 200x multiplier, while five bells can be worth 100x. Coming to the wagering, there are one to 10 betting levels and coins can be set from €0.01 up to €1.00. The lowest potential bet of €0.20 is very affordable considering there are 76 paylines. At the top end, meanwhile, the maximum stake can be €200.00. After impressing in the base game, Dazzle Me also excels for the special features. In this slot, it just feels like NetEnt gives players a little more when it comes to wild symbols and free spins. • Dazzling Wild Reels: a random feature that causes a reel entirely made up of wild symbols to overlay the reels. The wilds can overlay reels one to five and sub for all symbols except for free spins. • Free Spins: three, four, or five symbols can provide players with eight, 12, or 16 free spins, respectively. • Linked Reels: free spins get even better when the linked reels kick in and cause reels one and two to match, as well as reels three and four. Dazzle Me doesn’t need a story or overly complex features to be a great slot to play at NetEnt casinos. For starters, the graphics are crisp and compatible with a variety of devices. 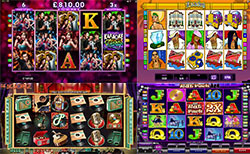 Of course, the slot also has an innovative structure and enhances wild symbols and free spins compared to other games out there.